lemon-hazelnut green beans | Is there any wine left? I learned to make these green beans in a cooking class at Central Market a few years ago. They are so easy and I always have the ingredients on hand. This is the version of the recipe CM gave us, but there are endless variations! Begin by snapping the ends off of the beans and blanching them for 3-4 minutes. We like crunchy beans in our house, so if you like them softer, just keep them in the boiling water for an extra 2-3 minutes. 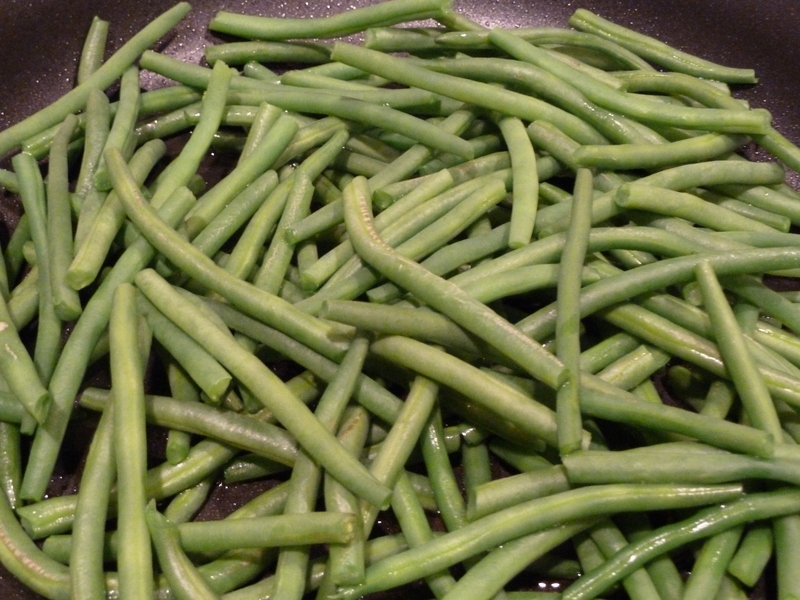 Remove the green beans to an ice bath to stop the cooking process, then strain them in a colander. 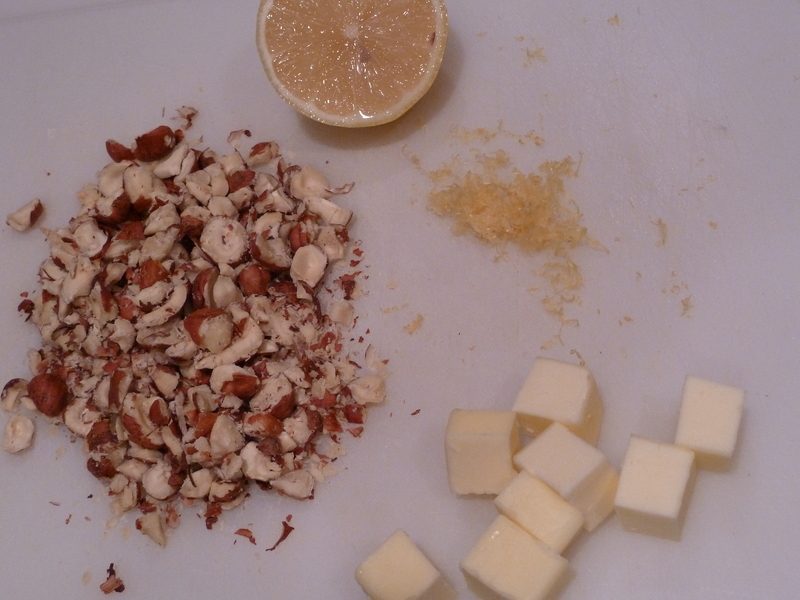 In the mean time, get the rest of the ingredients ready…zest a lemon, dice 1 tablespoon of butter and crush the hazelnuts. 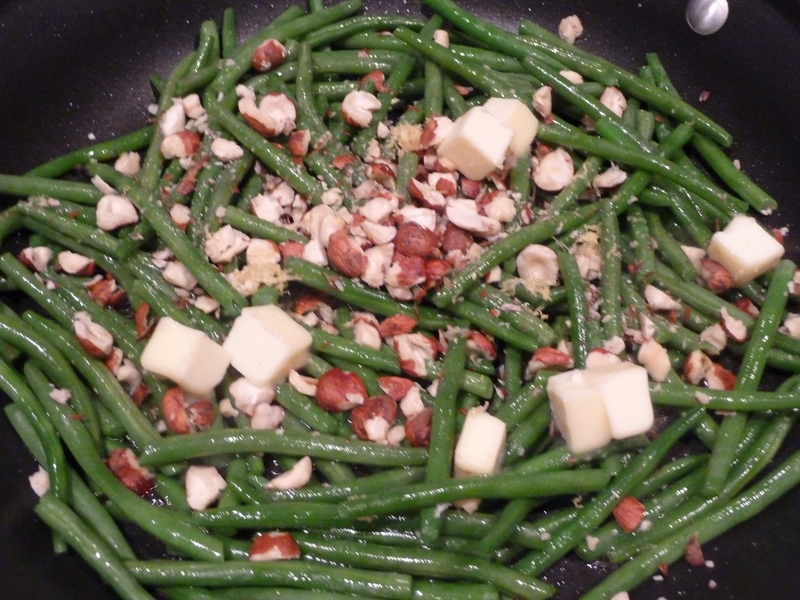 Throw your green beans into a preheated skillet and saute for a minute or so until they start to brown just a little. They are already cooked, so this is just to give them flavor and color. Once they’ve been cooking for a minute, add the butter, lemon zest, hazelnuts and a squeeze of lemon. Let the butter melt, then toss to coat. Heat a skillet over medium heat and bring a pot of water to a boil. Fill a separate bowl with ice water and set near the boiling water. Snap the ends off of the green beans and throw them into the boiling water. Cook for 3-4 minutes, then pull them out and put them into the ice bath. Drain into a colander. Chop 1 tbsp. butter into a small dice and set aside. With the hazelnuts in a ziploc, use a meat pounder to crush them into small pieces. Zest a lemon with a fine microplane. Add the green beans to the heated skillet and saute for a minute. 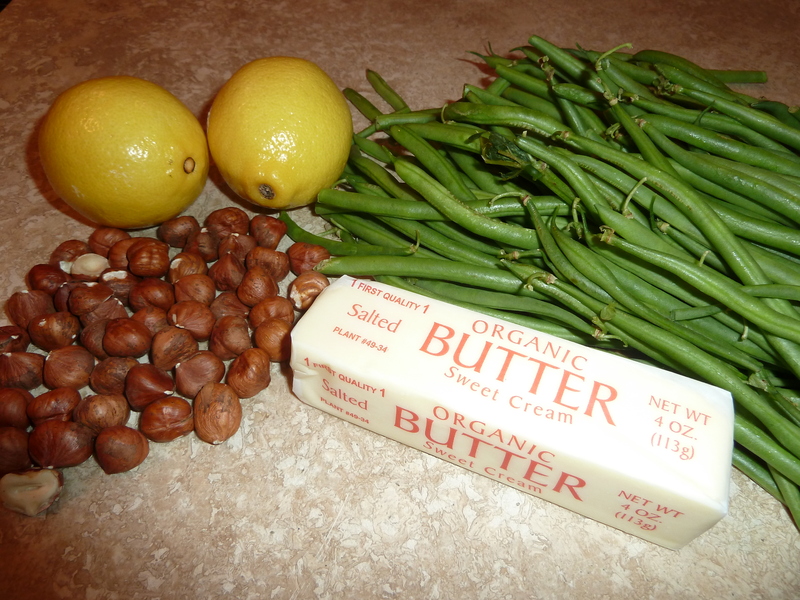 Once the beans start to brown, add the butter, lemon zest and hazelnuts, and squeeze the lemon over the pan. Let the butter melt, then toss to coat the green beans. note: my mom makes this recipe a lot and has come up with a great shortcut. She melts the butter, then adds the crushed hazelnuts, lemon zest and lemon juice. 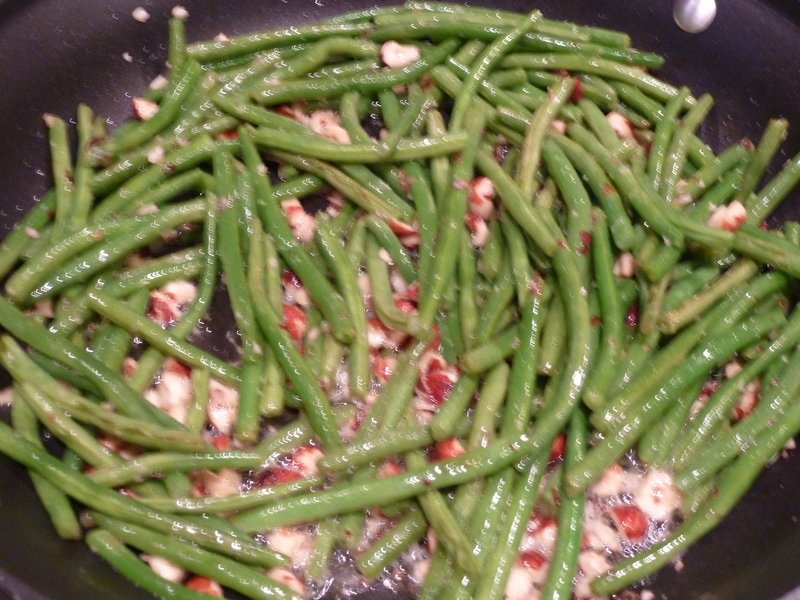 After blanching the green beans, she pours the melted butter mixture over the beans then serves them.